CarConvos: Alpha Based RWD Buick Coupe? A while Back GM held a sort of open house for the North Hollywood Design Center, Journalists were invited in to watch the Unveiling of the Cadillac ULC concept, and were allowed to wander the building to get a glimpse of its development, the Studio contained many mock ups, mostly from Cadillac, but other brands were represented as well. 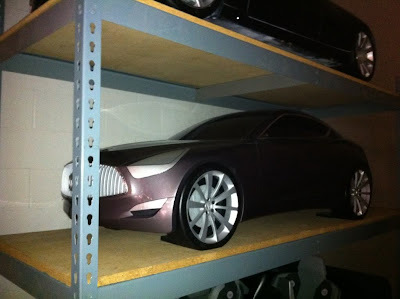 Most of these mockups were supposedly dead, although the Cadillac Ciel, is almost Identical to several of them, so perhaps some of the Bucks are just slightly different from future vehicles or concepts. At any rate I believe allot of information can be gleaned from the photos. Ever since the pictures were published I have been pouring over them, trying to pick up on details that were missed, and I believe I may have. This is purely speculation, but Bob Lutz has said that Pontiac was to get a Sporty RWD car based on a Cadillac platform, probably Alpha. 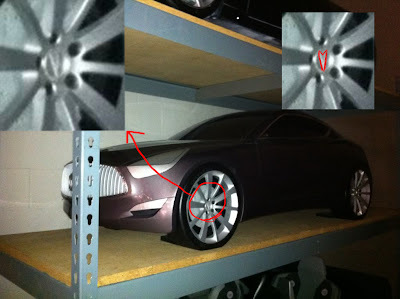 At the Design center there were shelves of mockups, the center two shelves are rumored to be solely Alpha based Bucks, possibly studies for the ATS and next Gen CTS, All but two of them are Cadillacs. Nestled among the Caddies were two others a Buick & a Pontiac, allot of blogs focused on the Pontiac, probably because the brand had recently shut its doors, the pictures of what could have been were like salt on the wounds. The Buick when largely unnoticed, until the other night when I was looking at it again, I noticed something funny about the wheels, and after looking closely I determined they bore a Pontiac arrowhead. This certainly threw me for a loop, but then I started thinking, what If designers borrowed a frame for a Pontiac Mock Up and built a Buick around it? It’s among the range of possibilities, and due to the cars placement on the shelves this could be the first glimpse of Buick’s Alpha car. I know a logo is hardly enough to base much on, but for the RWD fans out there here is a glimmer of hope for you. Design wise the car is quite nice, though hopefully any production versions that could come from this will receive some attention to the front end. Many cues seem to come from the Riviera Coupe Concept, and the Lower front fascia inductions are really different looking, and are repeated in the indentations on the lover doorskin. Again it’s not much to go on, but we can hope right?